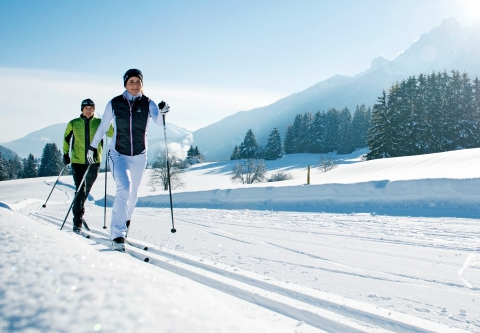 Whether you are just getting into Nordic skiing, taking up skate skiing, venturing off trail or upgrading to the next level we have something for you and all your friends. Getting into skiing want a system that’s easy, convenient and reliable. Let’s look at waxless ski’s. These ski’s have scales and always work well in all conditions. You want reliable grip even if it means sacrificing some glide. Atomic Skintec Redstar > this is a revolutionary ski featuring a mohair skin on the grip zone for super reliable grip and awesome glide. Almost any condition is no match for this system. These are a big hit with the experienced and athletic skier. When the conditions aren’t cooperating this is the one that skier Bob reaches for. Need some off trail versatility? Delta Classic For the athletic more performance focused skier. These are the ski of choice for Heather, Laurel and Susan here at Wilsons. The stiffer flex and narrow profile allow awesome glide with a good wax pocket for good grip. They are good value, reliable and durable. Get the system today with the Sport Pilot binding installed for $349 including install and ski straps. Regular $381. Looking for more support, speed and performance? It’s all about our Equipe and Vitane Pilot boots. Great for added confidence when you increase your speed on classic ski’s or jump into a pair of skate ski’s. Buy boots with any of our ski and binding packages and get a free pair of beautiful Defeet merino wool socks. Your feet will be warm, dry and happy with these. We feature ski and binding packages priced the same as our Classic packages Including the Rossi Zymax Skate and Delta Skate. Of course you can have the boot and binding package as well.